The Gulf of Thailand meets Cambodia across a relatively short coastline. Sihanoukville, one of Cambodia’s youngest cities, was carved out of the jungle in 1960 to create a port for the country and open up sea trade. Sihanoukville and it’s nearby islands are stunningly beautiful, one of the best places to enjoy the sun in South East Asia. In recent years, Serendipity beach (a part of Ochheuteal Beach) has become a backpacker party scene. Still a far cry from Koh Pha-Ngan, but growing legs. A short walk from the beach, Serendipity Road meets Mithona Street at a T-intersection, a haven of cheap restaurants, souvenir shops, massage parlours, hostels, and of course, the bars. Some of the bigger bars like Monkey Republic and Utopia (locked in a decibel war), offer accomodation, but for a little peace and quiet, look elsewhere. 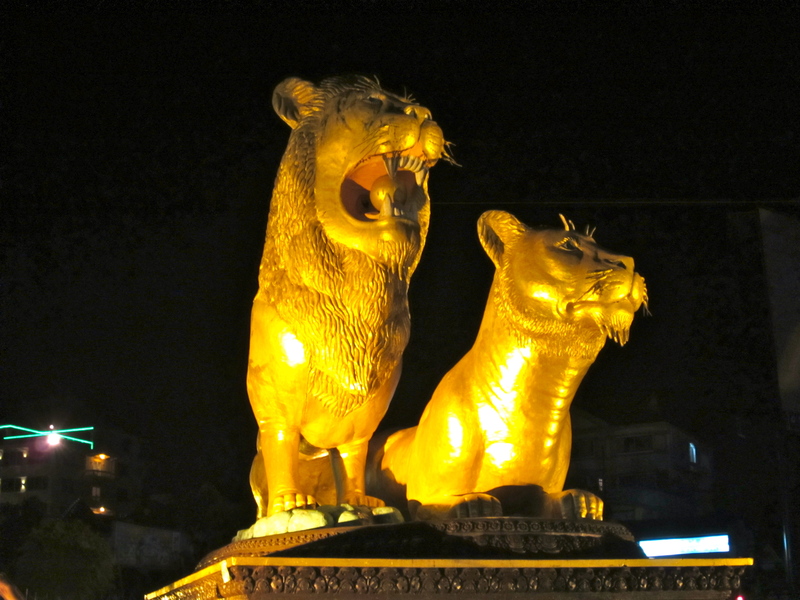 Golden lions and $0.50 beers. Welcome! Some of the touts will eventually convince you to join a boat trip to some of the surrounding islands; and be glad that you did, because they are beautiful. A dirty great car engine welded to the back of a long wooden boat provided the horsepower for the journey, whilst a group of gregarious Australians provided the entertainment. After a short spell at diving (without a great deal to see), the boat collided softly with the sand and anchored itself here; a tropical island. Just one of many off the coast. The boat driver went to work barbequing chicken, whilst the rest of us sat in the sun. After lunch the Australians got stuck into some beers, and floated around in the water near the moored boats. Our driver suggested the rest of us investigate a jungle trail that passed through the island to another beach on the other side. 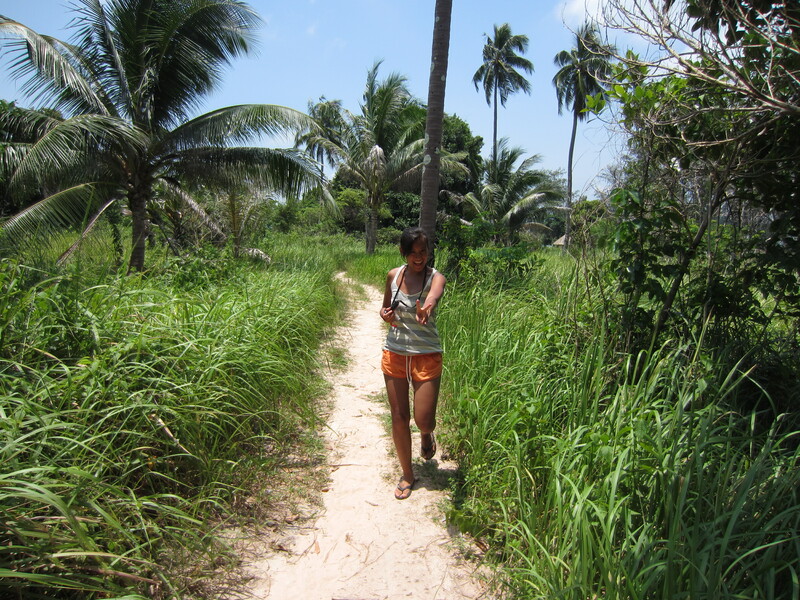 The path snaked through tall grasses and under leaning palms, and was swallowed by a small jungle. A relief from the heat; the sun was eclipsed by cool green trees and leafy undergrowth here, until we emerged on the island’s other side. A beach where the waves seemed more dramatic, the scenery more wild, more deserted. A beautiful, hidden beach. We looked out of our hotel window. An enormous python was making it’s way across the road. A scooter with two kids on it roared past, did a U-turn, picked up the snake, and sped off. 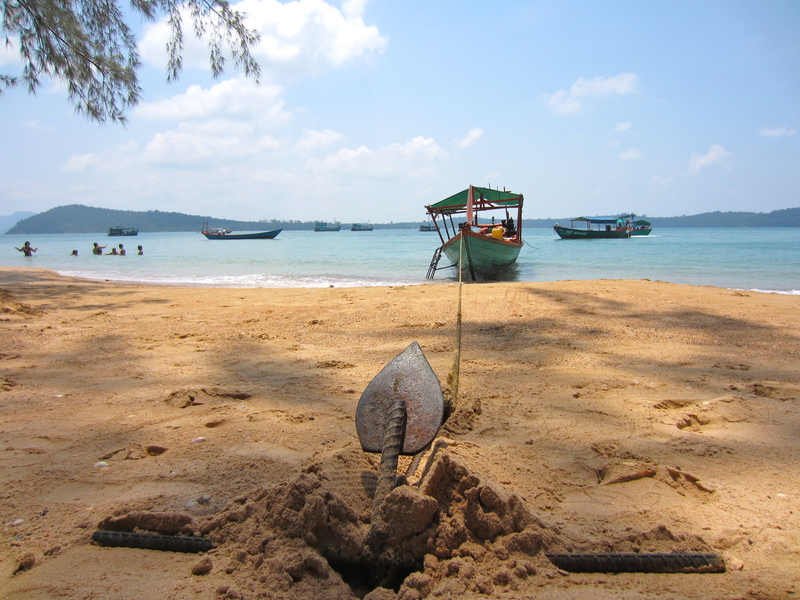 Sihanoukville – a bit weird, lots of beach, great fun!